sofamaniausa has no other items for sale. Good deal... Fast shipping... Thank you. Great product, great price! Super fast shipping, excellent seller! The mattress is very nice! Fast shipping too. Thanks! I've needed a new mattress for quite some time now. But I didn't want to pay the super high prices that some places ask for them. When I saw this one for $169 I was skeptical. 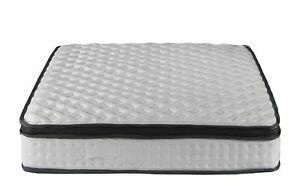 But I went ahead and ordered it because it was affordable and I figured it had to be better than my old mattress. I've only slept on and a few nights now but I really love it. It seems very well built and is very comfortable. When it showed up at my place, It it was so heavy I could barely carry it into my house. I would definitely recommend this mattress. It's rated for up to a 400 lb person and I weigh 200 pounds. It's firm, but not overly firm. Recieved mine in two days from GA. Warehouse. Heavy but I carried it in myself. Carefully unwrapped and rolled into position and cut the shrink wrap off. Inflates in seconds. Minimal odor. Slept on it right away. Feels firm at first but you will notice your pressure points sink in. Great for back support. Almost no movement to your partners side when you move or get up in the nite. Best sleep I have had in a while. It has a slight smell of something like a fabric softener sheet that will go away over time. Other than that it is better than expected. For the price it's a great deal. I will order another when the time comes. These mattresses are amazing !! I bought this mattress for my mother for Mother’s Day, she usually averages four hours of sleep a night, well now her average is 6 to 9 hours of sleep at night . Best sleep she’s had in years. Highly recommend !! Not too firm, not too soft, just right for me.. So far. I love my mattress...!!! There's not too much to say yet.. Honestly, time will tell..